Last night our bioluminescence paddle was so incredible that we added more dates for September! Water was glowing and sparkling with each stroke of the kayak blade…erie, cool and memorable with marine mammals coming in close for a better look at us! Join us at http://www.bluewaterventures.org! Over the last 20 years of kayaking in Elkhorn Slough, I’ve witnessed an amazing array of species and behaviors. The theme of our tours could be “weird otter behaviors”. They are a constant source of entertainment and intrigue. On Saturday, I observed a female sea otter holding a young harbor seal on her chest. Apparently, she had been “holding” or “holding captive” this young seal for several days. Perhaps this female lost her otter pup and she chose to adopt another pup, just happened to be a pup of another species. No one will ever know but they are amazing animals to share the Slough with! 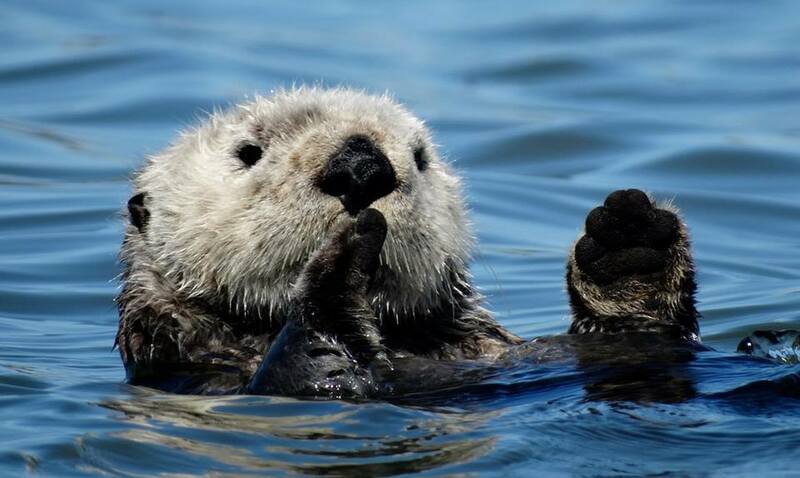 During our naturalist-led kayaking tours in Elkhorn Slough we see the most amazing behaviors. White Pelicans, with a wing span of 9 feet are featured here foraging in the wetlands. Unlike the Western Brown Pelicans that plunged from the sky when feeding, White Pelicans scoop food without diving. They are known to work together to heard fish by forming a net with their collective bodies. Join us for an unforgettable day kayaking in Elkhorn Slough! The key to successful kayak rescues for 8-10 year olds is making it FUN and having them feel comfortable with their gear…..jump on! Join Blue Water Venture’s Marine Science and Kayaking Camp based in Santa Cruz, California. During our daily educational adventures, we’ll explore the tidepools of Natural Bridges, hike among the elephant seals of Ano Nuevo, learn kayak rescue skills and enjoy a kayaking expedition to Elkhorn Slough. Our naturalist-led program includes a scavenger hunt through the touch tanks and aquarium of the Seymour Center, home to the stealthy Red Octupus!